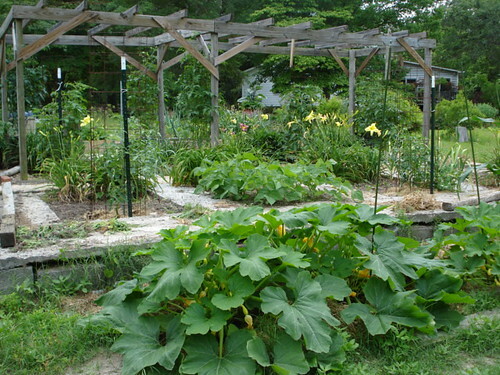 Although I have been gardening for years, there are many vegetables I have never grown. Can you describe what is in your pictures? They look like they are doing well. 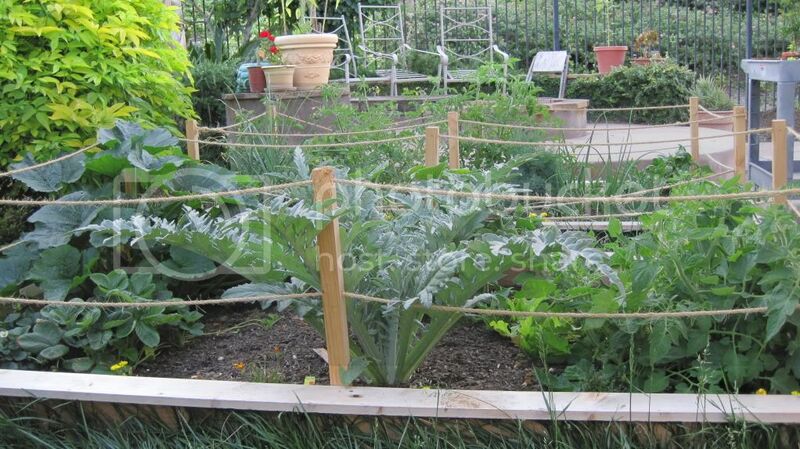 freedhardwoods wrote: Although I have been gardening for years, there are many vegetables I have never grown. Can you describe what is in your pictures? They look like they are doing well. I am growing a variety this year to see what works in my climate.. I am in so california. The far left picture is zuchinni top left, cucumber top middle, eggplant top right, roma tomato bottom right, artichoke bottom middle, strawberries bottom left. 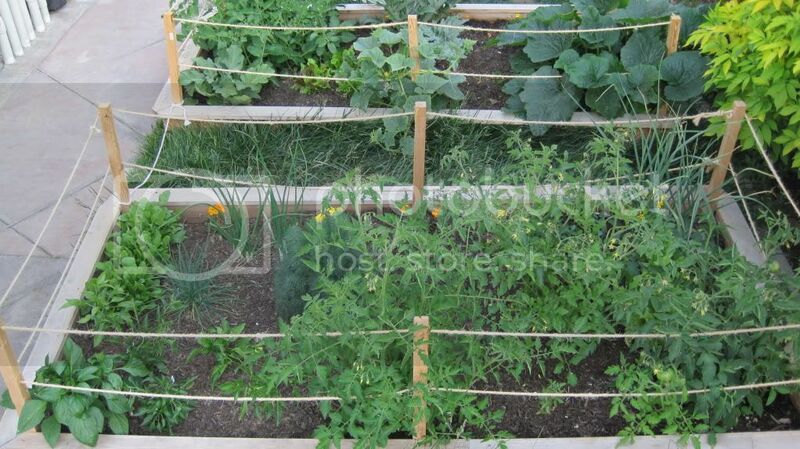 there is marigolds as well and some mixed lettuce. 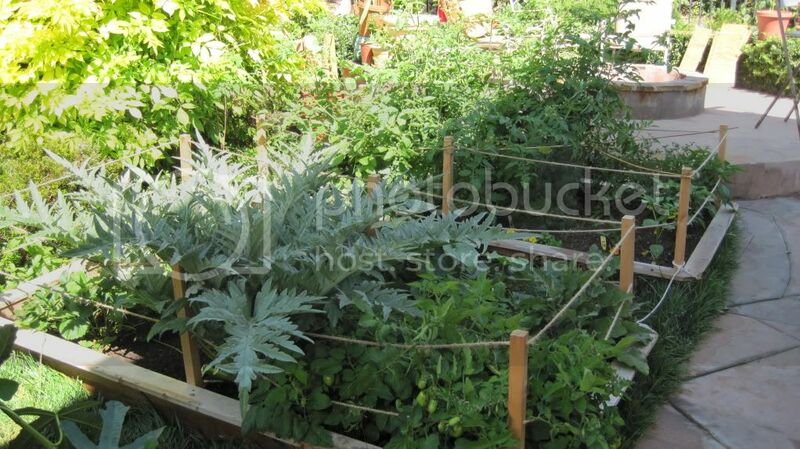 The 2nd to last picture has big boy tomatos, delicious tomatos, husky cherry red tomatos, yellow pear tomatos, jalapenos, green bell pepper, ancho peppers, serrano peppers, orange bell peppers, green onions, garlic, oregano, basil, dill, spinach, arugula. these pictures were taken three weeks ago. Now the garden is a lot fuller. I never would have guessed all that was in there. Good use of space. Keep us posted. Looks great! 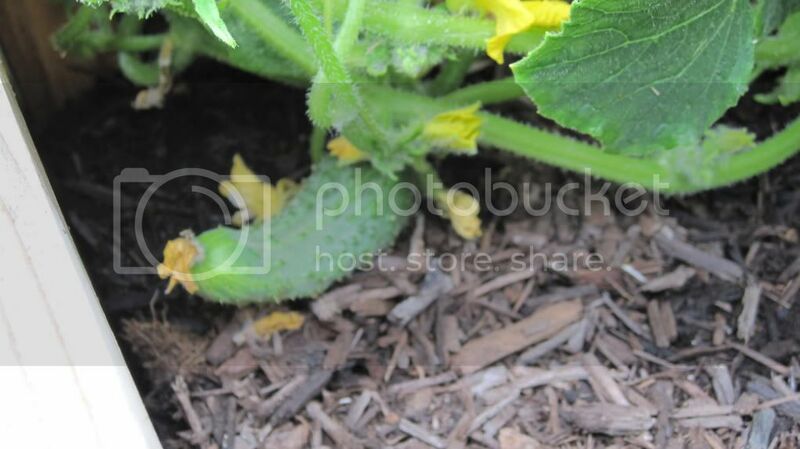 You might want to get a cage for that cucumber, they can go wild! Give it 2 months and you'll see what I mean! Original block garden area is in ground and in the back of this photo. 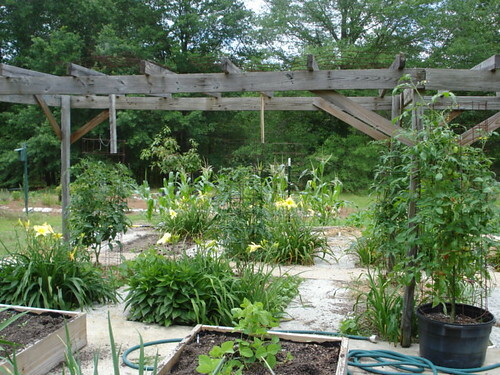 Foreground is original raised bed area which was renovated last year. Lots of succession planting going on. Sweet peas have been replaced with green beans. Spinach was pulled today and have seeded cucumbers there. Garlic is being pulled and will replace with beans and cucumbers. 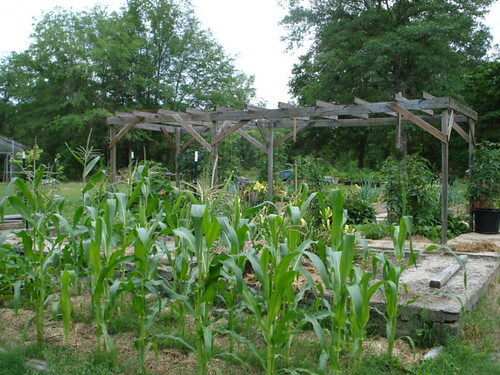 The area currently contains corn, squash, zucchini, egg plant, strawberry plants, lettuce, edible soy beans, tomatoes, potatoes, radishes, garlic, arugula, young cucumber vines plus each bed contains some kind of flowers, mostly day lilies, iris, and rudbeckia. This next area is our newest set of three raised beds, mostly with strawberry plants and raspberry plants, but also interplanted with beans, cucumbers, and spinach. 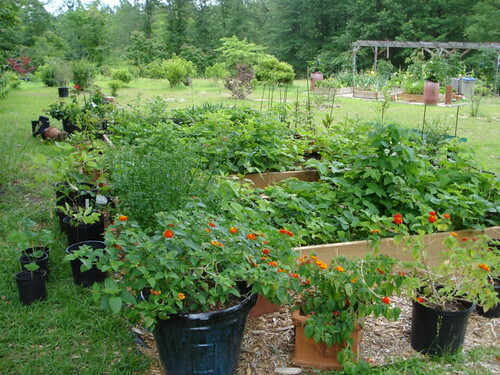 The area also serves as a small nursery and temporary home for lots of potted items including some container grown peppers egg plants and strawberry plants. There are no flowers in the raised beds, but are many container grown flowering plants on the weed free zone around the beds. 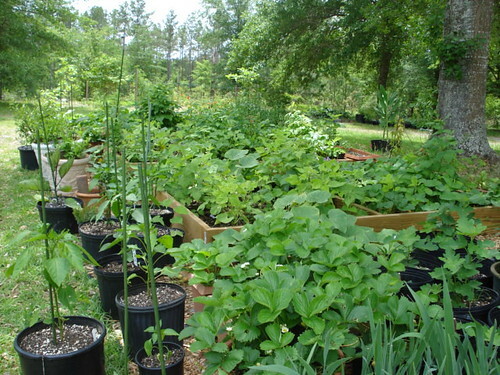 Here is a little closer view of an interplanted group of raspberry, cucumber, and beans, with strawberry plants in the back of the bed, and lots of containers all around. This area is a new 'in the ground' plot. The soil is almost pure sand and has not been improved yet. Is probably about the closest thing one could find to 'dead' soil. Next year the area will get a lot of compost. 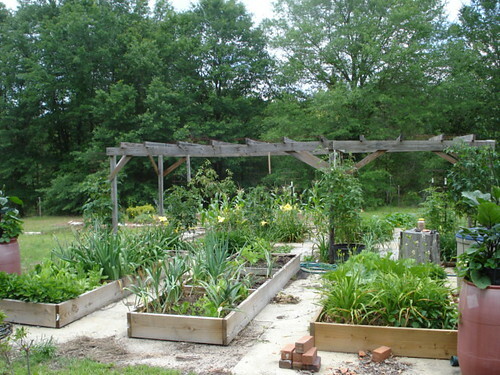 This year the plants won't be lush and dark green like most of the garden, but should grow enough to give a decent harvest of tomatoes, butter beans, green beans, cantalope, watermelon, and a dab of okra. 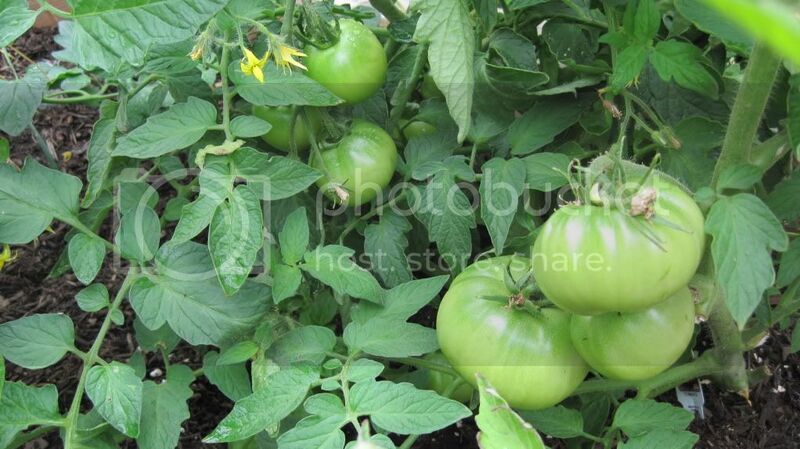 The tomatoes have drip irrigation which will soon supply the melons as well. 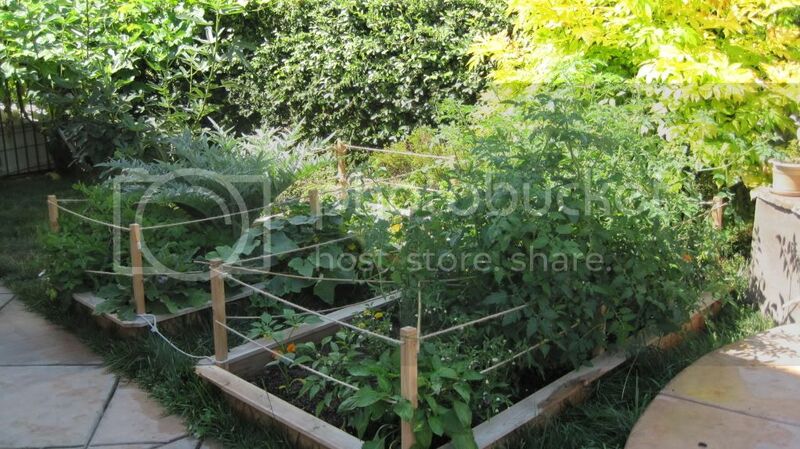 you just put my little garden to shame.. great work though..
Alex, I'm green with envy. Is this what retirement is all about? 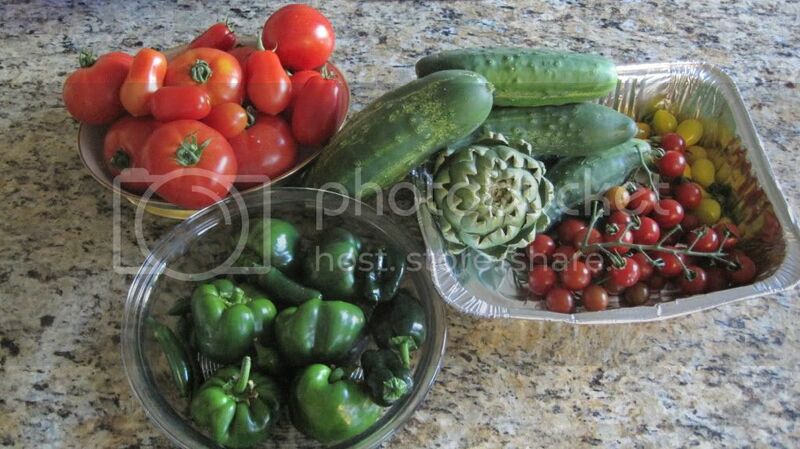 Wow, take all your produce to the local Farmers Market and you have a great 2nd income!! because I am sure maintaining this is a full time job. I always enjoy seeing your pics. Thanks for sharing. Well done Alex! 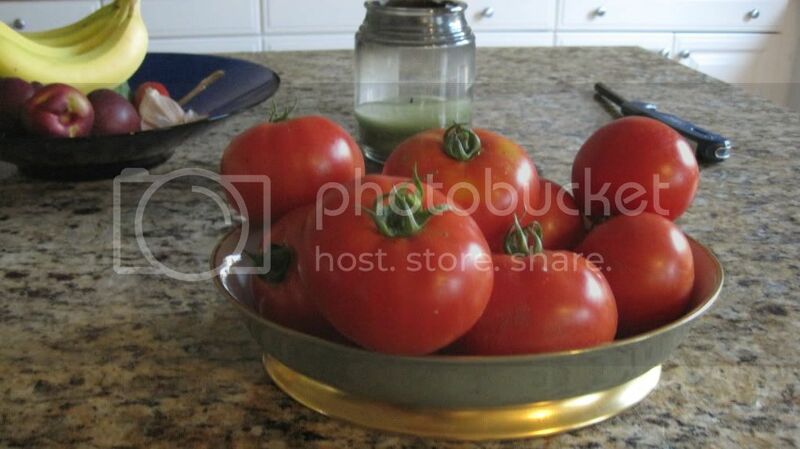 I'm coming around later with my trug (wooden vegetable carrier). I will be bringing it empty and hope to go home with it full. However, will take me a while to get there seeing as I have long long way to get to you. Alex, I was wondering, you and some of the other guys and girls seem to have so much land space. 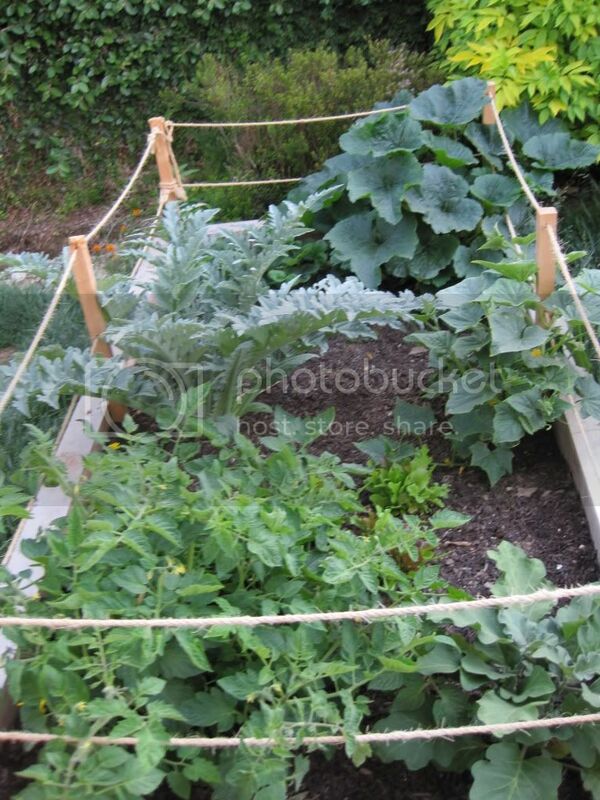 Is this your garden at the back of your home or is it an allotment or a land space that you rent? here are some pics of the progress in my garden.. I am happy with the results thus far. already have had fresh garlic fresh grn onions basil oregano spinach lettuce some strawberries and evrything is groing very well no problems up until now.. since this is my first time actually doing my own raised veggie garden organically nothing other than water and organic compost and mulch. 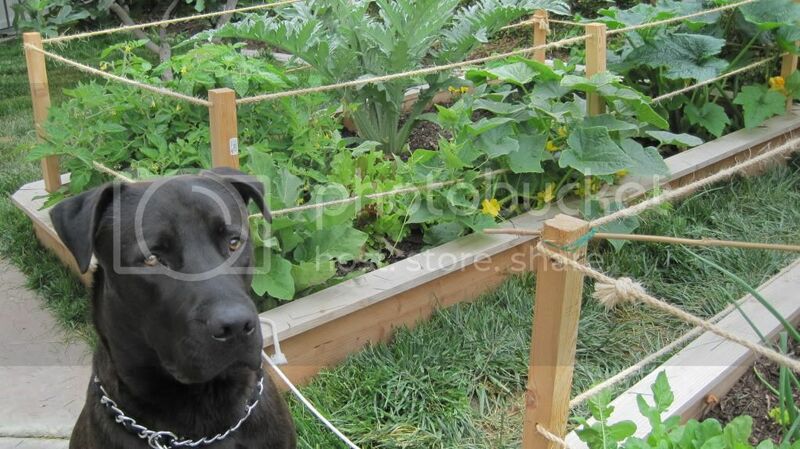 Great looking garden you have there! 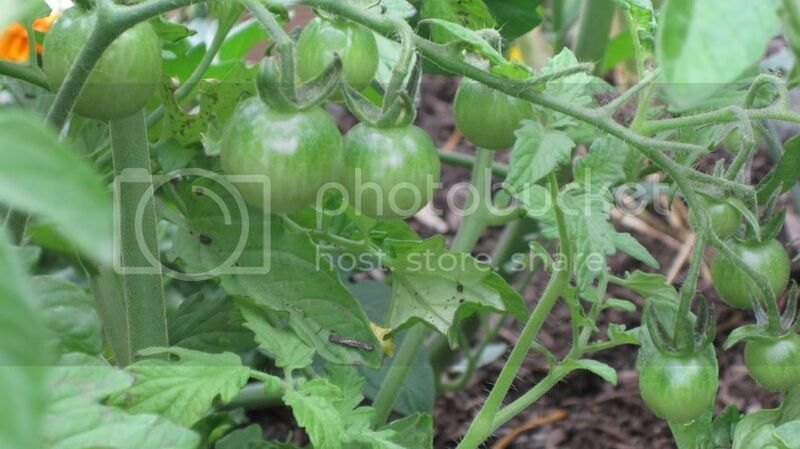 I can't wait until I have some little green maters on my plants. Thanks for sharing. Looks REALLY great! 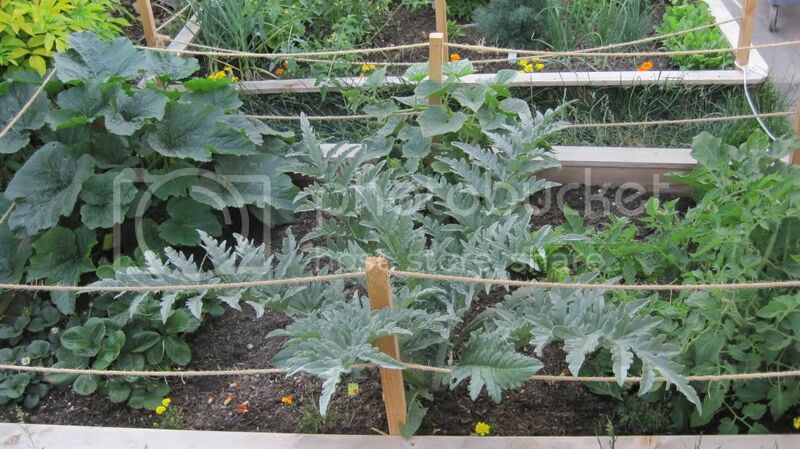 But WOW the artichoke really takes up a lot of space doesn't it. Does it grow more "buds" after you cut off the ones that are ready to eat? 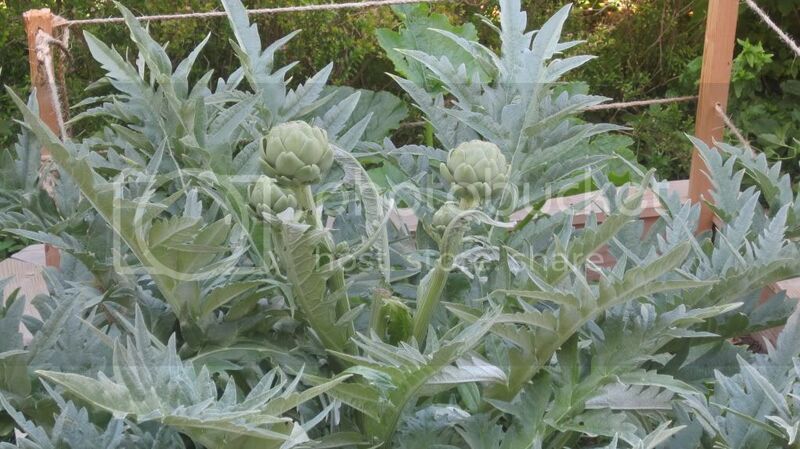 I love artichokes, but the weather around here doesn't agree with the biennial variety. I've been seeing a few single season varieties in catalogs, but I don't really have the space if after all the work to coddle and extend the season I'd have to do, all I'm going to get is one or two heads... and you can't even eat the leaves on those like you can with broccoli and cauliflower... unless you're a goat! hendi_alex wrote: This area is a new 'in the ground' plot. The soil is almost pure sand and has not been improved yet. Is probably about the closest thing one could find to 'dead' soil. Next year the area will get a lot of compost. 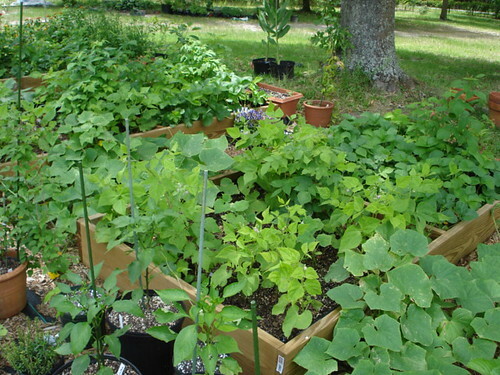 This year the plants won't be lush and dark green like most of the garden, but should grow enough to give a decent harvest of tomatoes, butter beans, green beans, cantalope, watermelon, and a dab of okra. 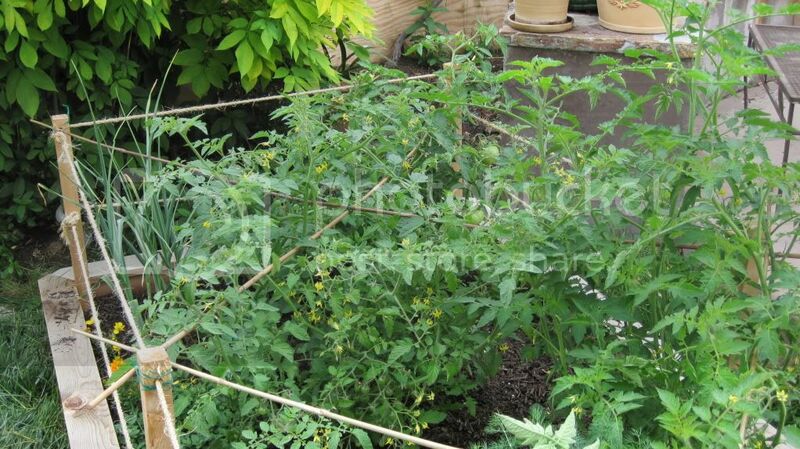 The tomatoes have drip irrigation which will soon supply the melons as well. Alex, this area looks like a prime candidate for winter cover crop to add more humus. I can't remember if you said you till or not. I prefer the no-till kind that winterkills then I can just dump compost, etc. on top in spring, but maybe that's not an easy option for your warmer climate. You could always do the M. Fukuoka method of mowing (I guess with brush mower if you don't have a scythe ) and scattering without tilling.